Latin America’s first combined concentrated solar power (CSP) and solar PV project is moving forward following the May closing of $758 million in financing by Cerro Dominador, a Chilean company owned by investment funds managed by EIG Global Energy Partners. The news got lost a little back in the middle of May when Cerro Dominador — the company created to develop the 210 megawatt (MW) combined CSP and solar PV project in the Atacama desert of Chile — closed $758 million in financing for the construction of the project’s CSP portion. Located more specifically in Maria Elena, near Calama, in the Antofagasta Region, the project will benefit from some of the highest solar radiation anywhere in the world. The necessary $758 million in financing was completed with a group of international institutions and the contribution of local banks, including Natixis, Deutsche Bank, Société Générale, ABN AMRO, Santander, Commerzbank, and BTG Pactual. 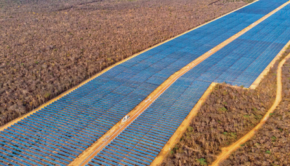 Construction of the Cerro Dominador project got underway last year with the first 62 MW of the solar PV portion of the project, which was brought up to its full 100 MW in February of this year. The CSP portion will add another 110 MW which will serve to avoid emissions worth 640,000 tonnes of CO2 annually, and when combined with the solar PV aspect of the project, avoiding emissions worth 870,000 tonnes of CO2 per year. Upon completion, Cerro Dominador — which means “dominating hill” — will go down as Latin America’s first combined CSP and solar PV project. EIG Global Energy Partners — one of the world’s leading providers of institutional capital to the global energy industry — acquired position and management of the project towards the end of 2016.